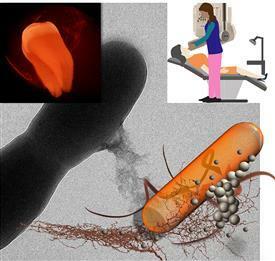 Caption : In this illustration, nanoparticles attach to or are taken up by the bacteria cells. Pan and his students are the first group to demonstrate that early detection of dental plaque in the clinic is possible using the regular intraoral X-ray machine which can seek out harmful bacteria populations. Credit: University of Illinois Laboratory for Materials in Medicine.